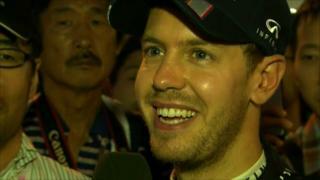 Sebastian Vettel hails the "incredible" performance of his Red Bull team, following a dominant victory in the Japanese Grand Prix at Suzuka. Vettel tells BBC Sport's Jake Humphrey and David Coulthard his car felt "amazing" on a weekend that saw him take pole position, lead every lap of the race and set the fastest lap time. The win has cut Fernando Alonso's championship lead down to just four points, with five races remaining this season.